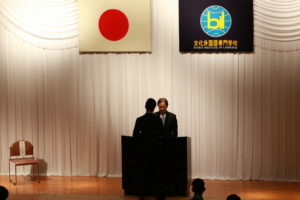 The entrance ceremony was held on April 10th. 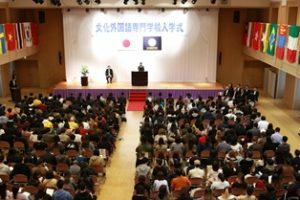 BIL welcomed 188 new students, including 139 students of Japanese Language Course, 10 students of Japanese Language Teacher Training Course, and 39 students of Business Japanese Interpreting Course. Short-term international students also attended, being consisted of 3 people from Università Ca' Foscari Venezia in Italy and 4 people from Srinakharinwirot University in Thailand. Students belonging to BIL come from 32 countries and regions. 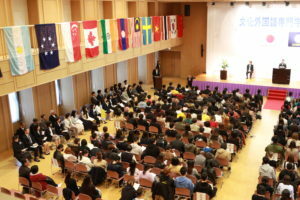 All staffs hope that every student from different countries can understand and respect one another, and study with fun. Although the weather was unseasonably cold, the entrance ceremony came to be a hopeful one for students to reach the starting line. 4월10일에 입학식이 있었습니다. 전체 신입생수는 188명. 그 중에 일본어과가 139명, 일본어교사양성과가 10명, 일본어통역비즈니스과가 39명이었습니다. 그 외에도 단기연수생으로 이탈리아의 베네치아대학에서3명, 타이의 시나카린위롯대학에서 4명의 학생이 함께 출석했습니다. 재학생의 출신국은 32개 국가와 지역에 이릅니다. 서로 다른 나라의 학생들이 서로 간의 이해와 존중을 바탕으로 즐겁게 학습해 주기를 교직원 일동 바라는 바입니다. 날씨는 봄날답지 않게 추운 하루였지만, 학생들에게는 새로운 스타트라인에 선 희망 찬 입학식이었습니다.